Big Marshmallow Cables - long (approx 12cm) chewy marshmallow cables - Qty In Order: 10 cables... More..
Mahoosive Marshmallow Cables - these are huuuuuuuuuuge! They are each about 29 inches long and thick too - and if you eat a whole one in one go you feel a bit queasy (just don`t ask me... how I would know!!). 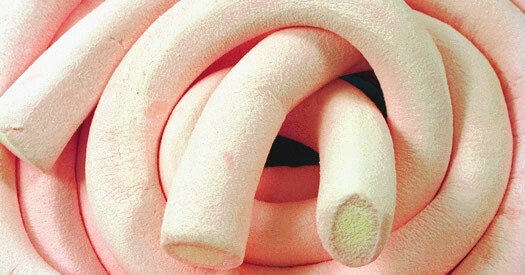 And if you curl them up tight they lo... More..
Marshmallow mix - we have hunted round and found the biggest, softest, squidgiest chewy marsh mallow cables and lumps!! Our old ones were good - these are out of this world!! - Qty In Order: a quarter of a kilogram - just over 8.8 ounces... More..
Mini Marshmallows - tiny weeny mallows - perfect for going on cakes, on hot chocolate - or shovelling into your mouth! - Qty In Order: a quarter of a kilogram - just over 8.8 ounces... More..
Twisty Marshmallows - squishy, mellowy, spongy and very very twisty delicious marshmallow. - Qty In Order: a quarter of a kilogram - just over 8.8 ounces... More..
Princess Marshmallows - white and pink squishy marshmallows - we get so many requests for these. . . and it`s easy to taste why. - Qty In Order: a quarter of a kilogram - just over 8.8 ounces... More..